We encourage local and foreign veterinary and pre veterinary students to get involved in our projects. We aim to inspire them to provide community service in their own environment once they qualify, as well as learning vital practical and clinical skills while working with our team. Rabies Elimination and Population Control Rabies Elimination through mass vaccination and sterilisation. Provision of basic veterinary care in the poorer communities of Southern Africa. YOU TOO can take responsibility for the people in your immediate world, by practicing and teaching responsible pet ownership within the home and work place. CVSSA is a registered Non Profit Company NPC 2016/079218/08 in South Africa endorsed and sponsored by Welttierschutzgesellschaft e.V Germany and partnered by Optima Community Veterinary Clinic (SAVA NGO). 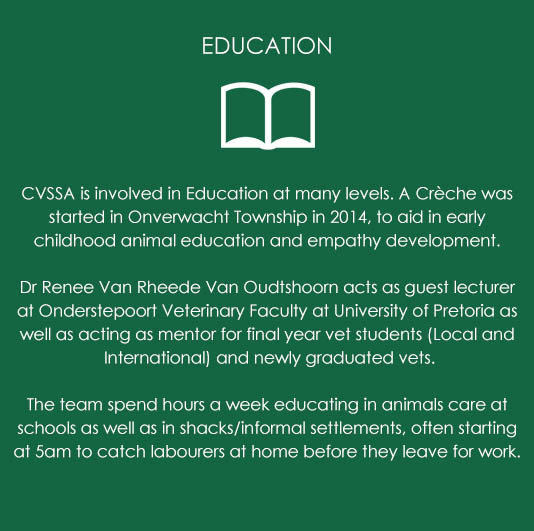 Dr Renee van Rheede Van Oudtshoorn has a veterinary practice in a small mining village, Cullinan (Cullinan Animal Hospital) in South Africa. During 2007 there was a rabies scare in the Cullinan area. Through one of her staff members she learnt of the plight of animals in the poorer community of Onverwacht just outside Cullinan. They had no veterinarian to help them with rabies vaccines. She promptly arranged a vaccination campaign, liaised with the state vet and vaccinated Onverwacht animals. During the vaccination campaign she realised that the community and the animals are in desperate need of veterinary assistance. She then arranged a meeting with the head master and teachers at the Onverwacht School. In this meeting the education of the children in basic pet care was highlighted. This is where the corner stones of all future work were laid. Out of the above a CHANGE took place in the community of Onverwacht as they became proud pet owners and realised that a pet will love you regardless. After 9 years this community has developed into responsible per owners, and despite poverty still visible, more and more of the pet owners are now forming part of her private practice client base. Due to growth in operations and requests by more and more communities pleading for veterinary assistance, she realised that she needed financial assistance and more veterinarians to assist her. She duely Registered as Optima Community Veterinary Clinic, a branch of South African Veterinary Association NGO. 2014 saw the birth of Vets For Change South Africa with her as one of 3 start up directors. 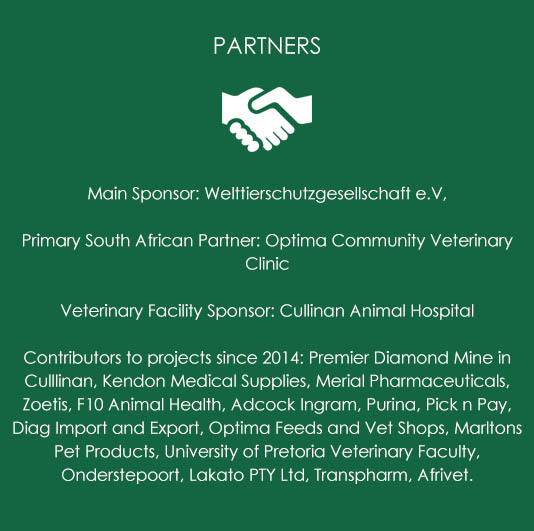 The following year saw the pioneering work of Vets For Change South Africa with Optima CVC NGO as partner, Welttiershutzgesellschaft e.V Germany as Main Sponsor and her as Principle Veterinarian for the projects. 2015/2016, due to the high demand for her team's outreach projects all accross Southern Africa, the team and partners saw the birth of Community Veterinary Services - Southern Africa (CVSSA). It was time to formalise the concept and CVSSA was born and registered with Registrar of Companies in South Africa. Our main sponsor remainsWelttierschutzgesellschaft e.V Germany. 2014, 2015 ( Projects Run under Optima CVC and Vets For Change South Africa) saw Wellttierschutzgesellschaft e. V offering their sponsorship and guardianship of our projects. 2016 Welttierschutzgesellschaft e. V offered main sponsorship to the CVS - Southern Africa projects, allowing us to reach deeper into Africa and assisting in the most impoverished areas. and through our educational work. WTG cooperates with local partner organisations and involves the people who are directly concerned. In WTG’s view worldwide animal welfare also starts at everyone’s own doorstep which is why they create awareness in their home country, Germany, to improve the relationship between humans and animals.